I was a boy of nine (almost ten), and it was getting dark. It was New Years Day, and I had just discovered college football. I wondered through our family’s den with a sketch pad tucked under my arm and several pencils in my hand. Not sure where I was going, but I was probably looking for a quiet spot to draw pictures of myself driving life-sized versions of my matchbox cars, which was a favorite pastime of mine in those days. Regardless, my dad called me over and explained to me that the football game on television was called the Orange Bowl and that I should watch it. He told me that one of the teams belonged (that’s my memory, but probably not his exact words) to Burt Reynolds, the guy who drove the Firebird in Smokey and the Bandit. That detail caught my attention, as I had a matchbox black Camaro that I pretended was the Bandit from time to time. I ran and retrieved my “Bandit” then plopped down in front of the TV to draw myself and Burt in the car. But the game drew me in, and before I knew it, I was trying to draw a football helmet instead of a Pontiac. 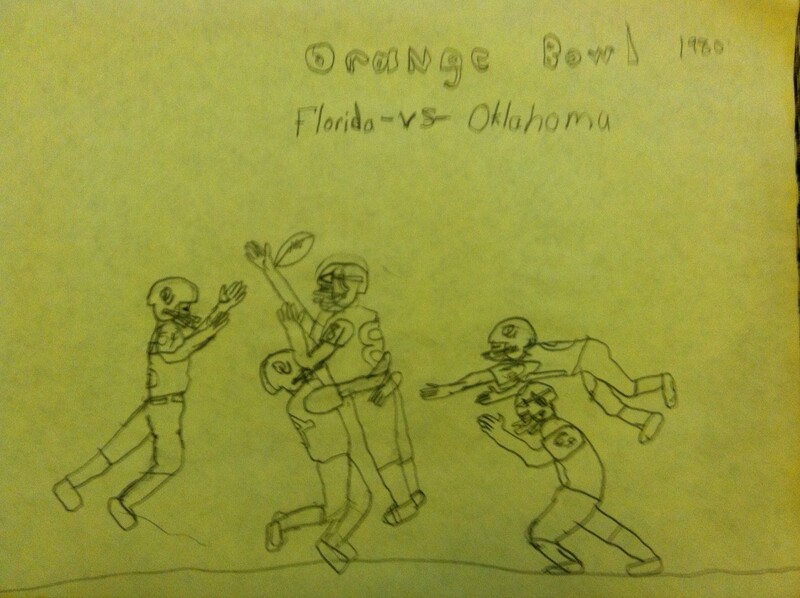 I don’t remember any major details of the game, other than the Oklahoma Sooners won over the Florida [State] Seminoles. This made me happy, because the nickname “Sooners” sounded immediate and exciting to me, and I had no idea what a Seminole was. I also remember that the Sooners threw the football to each other with a frequency that apparently surprised my dad, and that the Seminoles didn’t seem very good at tackling. I spent the rest of the evening in front of the television, drawing scenes from the New Years bowl games (I think the rest of the games were over at this point, but I may not have understood highlights versus live action). My dad told me that Clemson lost to Baylor the night before, which made me happy, even though I didn’t really know why (my main aversion to Clemson in those days was the sweat-stained tigerpaw t-shirts of the grimey schoolyard bullies). He also told me that South Carolina lost to Missouri a couple of days earlier. This was an absolute affront to my sensibilities and seemed like a painful reliving of the Civil War (which I was also slightly obsessed with at the time). I learned from the announcers that New Years Day was the best day for the very best teams to play, and that the season would be over as soon as the Orange Bowl game finished. But I just got interested! television thought George Rogers was going to have a big year in 1980, and it would turn out that they were right. But I remember the anticipation of that spring and summer as I waited and waited for college football to start up again. I get that same excited feeling each year, although my distractions from the games are no longer just drawing paper and matchbox cars. Now work issues, social obligations, weddings, and even funerals (not my dad’s yet, thank God) crowd college football from my mind for much of the year. It doesn’t help that the innocence of college football seems as distant as that Orange Bowl from days gone by, what with most converage of college athletics nowadays being about impermissive benefits, conference realignment, off-season arrests, and ESPN-fed profits. But gentle reader, another season of college football is about to kick off, fresh and new. And despite the sport’s many flaws, it still draws me in. I’ll be watching the South Carolina Gamecocks from the stands this weekend, accompanied by my two sons. One of them just turned ten. I have no idea how the season will develop, whether one team will throw the ball too much, or if the other team can tackle. And I don’t really have any firm idea about how the Gamecocks will fare. But a lot of people on the internet and on television think a guy named Marcus Lattimore is going to have a big year in 2011, so we all need to temporarily put down whatever else we are doing and watch. Here’s to a great 2011 football season! Next Post NEW FEATURE: We Interpret CoachSpeak!